A firefighter battles the Soberanes fire in Monterey County. Authorities are considering what potential penalties face those who set an illegal campfire that ballooned into a massive wildfire near the scenic Big Sur region of California. Officials want the public's help to find whoever started the Soberanes fire that blew up to more than 45,800 acres — or 71 square miles. "Dry night conditions allowed the fire to creep through the night," Cal Fire officials said on their website. Flames continue to "burn in steep, rugged and inaccessible terrain," according to Cal Fire officials, who said that a state of emergency has been declared. As of Wednesday, the blaze had destroyed 57 homes and 11 outbuildings, and damaged three structures and two outbuildings. 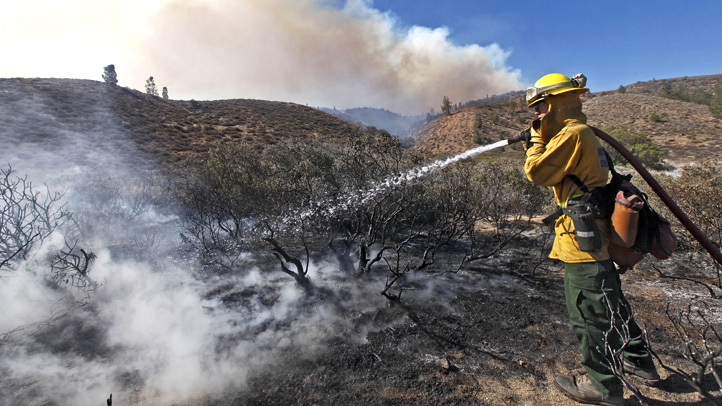 It is now 25 percent contained, Cal Fire said. Monterey County sheriff's Cmdr. John Thornburg says those responsible could face civil penalties for the cost to fight the fire. Prosecutors also could file charges in the death of 35-year-old Robert Reagan, a bulldozer operator who was killed on the fire lines during a rollover accident. Investigators determined that an unattended campfire started the blaze on July 22 in a day-use area of Garapata Park. The area is clearly marked with signs saying campfires are prohibited. Officials said Wednesday that more than 5,500 firefighters are battling the Soberanes fire, with the assistance of 504 engines, 54 water tenders, 17 helicopters and six air tankers.